While music, especially performed live, can make people feel better about themselves, sooth and calm them, music played on the harp has an extra dimension. For centuries the harp and its music have been seen as something magical. Today, the harp gets many positive reactions from people of all walks of life; (almost) everyone enjoys seeing the harp, hearing its sounds and playing the harp themselves. Harp music played in a therapeutic way tends to calm people down, letting them enjoy a few minutes of rest. It can help people breathe easier and give them something else to focus on so it relieves pain. In care settings, the harp not only brings joy to the people living there, but can also give a few moments of calm to the working staff. The music can dramatically change the overall atmosphere. Therapeutic harp music is fitted to the listener. The therapeutic harp practitioner will make use of the modes (specific scales) on the harp, to create a mood in the music. This way the harpist can fit the music to the mood of the listener, or even try to change the mood. Breathing patterns and heartrate can be used to set a tempo for the improvised music. The therapeutic harp practitioner will take into account the preference of the person he/she is playing for. Pitch and loudness will have a big effect on the overall experience of the listener. Lastly, the therapeutic harp practitioner can make use of resonant tone. Music is vibration, just like everything else. The cells in our body also vibrate. Matching the vibration of the harp to a person will make the music resonate more and make for a more intimate experience. The music is mostly created in the moment, bringing each person their special song. It can be an emotional experience. Anouk has been playing therapeutic harp music for many years. She started out be playing for people with Alzheimer’s disease, but over the years has played for many people with special needs, ranging from dementia, to epilepsy and also hospice care. 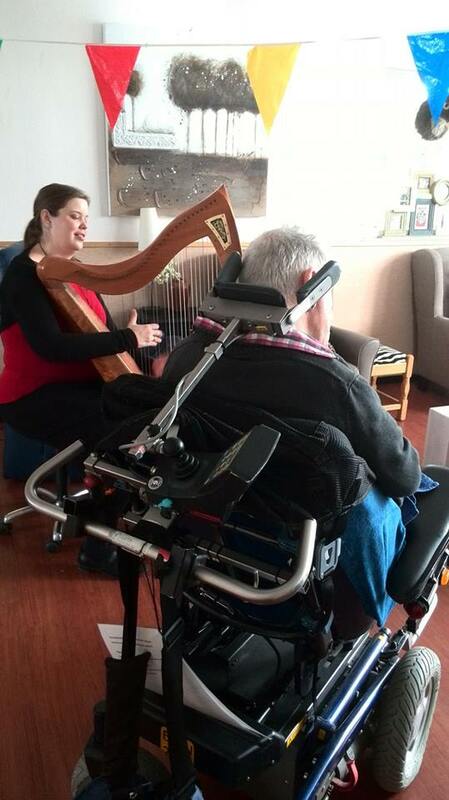 Therapeutic harp music has become one of Anouk’s specialities. She is frequently asked to play in care facilities. She passes on her experience in workshops all over Europe and her therapeutic harp music course.